It's easy to be skeptical when the phrase "chain restaurant" gets thrown around. Images of flat, flavorless burgers, cookie cutter structures, and quirky neon colored cocktails will usually come to mind. When Brandy first came to the USA, chain restaurants were all the rage and it was difficult to find any independent establishments. "I understand the appeal of them, being able to get the same meal no matter where you are in the country," Brandy mused, "But knowing the vast majority of the food is pre-cooked and frozen at those places just strips away all the desire for me." One notable exception is Le Pain Quotidien (which translates to "The Daily Bread"), a European based bakery and cafe founded by baker Chef Alain Coumont with over 200 locations world wide, which are just now testing the waters in Chicago with their newest location in the West Loop. Le Pain (for short) may be a chain in theory, but their ways of doing things are vastly different than any other chain you might come across. Their breads, the corner stone of their business, are baked fresh from scratch every single day on site, and all of their food is sourced as locally as possible for each location. An emphasis is made on using seasonal produce as well as creating traditional French Provincial dishes in a clean, healthy, and organic way. This, to be sure, is no ordinary chain restaurant, which is why Brandy enlisted her dear friend Bailey Blue (Brandy considers Bailey her resident expert in all things organic, as Bailey grew up on a farm) to accompany her to Le Pain for a little brunch. The inside of Le Pain was adorably rustic with one side being devoted to the cafe and "pantry" while the other side was dotted with butcher block tables. The centerpiece of the dining area was one large communal table (there is one in every Le Pain location, carrying through a tradition of community and sharing from the founder's Belgian upbringing), serving either as a spot for larger dining parties or as a meeting area for the cooking classes and wine and beer tastings the space would eventually hold. The back of the room was made up of a large glass wall which allowed diners to watch the bakers in action as they prepared the breads and pastries for the store (this bakery will also eventually supply two other locations opening over the next few months in Lincoln Park and Gold Coast). The extensive menu proved to be a bit daunting for Brandy and Bailey, so they decided to start off with some drinks while they whittled down their options; for Brandy, a lovely Iced Latte with almond milk, and for Bailey, a fresh Strawberry Lemonade. They both especially loved how the lemonade was served; presented with a glass of ice topped with a sprig of mint and a small carafe of the lemonade to pour at the drinker's whim. "Seeing as how all those beautiful loaves of bread are staring us in the face (as is the baker who's making them), perhaps we should start with the Baker's Basket," Brandy suggested, to which Bailey wholeheartedly agreed. The basket came jam packed with slices of all different sorts of breads as well a variety of Le Pain's own spreads and jams. The standout amongst the breads was something called The Flute, which was a long, narrow bread filled with raisins and hazelnuts. "It's like trail mix in a bread!" Bailey exclaimed, "And it could fit in my pocket, so I could actually take it hiking a trail with me!" The Strawberry Rhubarb Jam was another hit with its gentle tartness, but the one that had Brandy and Bailey's eyes rolling back in their heads from bliss was the Speculoos, a spread not unlike peanut butter in consistency, which is made with cinnamon and ginger spiced cookies. Glancing over at the pantry section of the store, Brandy could just make out a few jars of the heavenly stuff on the shelf. "Keep your eyes on those," she told Bailey in a whisper, "If anyone makes a move towards them before we're done, tackle them like a linebacker." Bailey nodded solemnly. Finally the entrees were decided upon. To split, Brandy and Bailey ordered the Smoked Salmon Tartine, a sort of open faced sandwich with thin slices of salmon, scallions, dill, and fresh avocado on the side. Bailey, as an eternal worshiper of salmon in any form, was in love from the first bite, but for Brandy, who tends to be a bit more skeptical about fish, it took exactly two bites for her to be convinced. "So fresh!" she exclaimed, "No fishy taste whatsoever and the herbs are just perfect." Bailey didn't hear her, as she was too busy reaching for another slice. For Bailey's entree, she chose the Belgian Waffle, a traditional little confection served with strawberry jam and fresh whipped cream. Bailey thought the texture of the waffle was just divine, as the outside had a lovely crunch, but it was the airy inside that really surprised her. "I thought it might be a bit heavy from the look of it," she said, "But it's really nice and light on the inside!" Brandy chose the daily Vegetable Quiche, which was made with spinach and mushrooms and came with a very colorful side salad. Brandy couldn't resist diving into the salad first, as the beautiful slices of yellow beets and ribbons of orange carrots against a bed of red and green was just too pretty to resist. The salad was perfectly dressed with a bright vinaigrette using a very light hand, which Brandy greatly appreciated. The quiche itself was quite nice: the top had a great baked flavor, while the inside was jam packed with the veggies, making for a less eggy taste in general. This was a more substantial quiche in texture than others Brandy has encountered, but she didn't mind at all. "As long as a quiche is well balanced in its filling and unobtrusive in its crust, I'm a fan no matter if it's on the creamier, airier, or denser side," she explained. To finish off, Brandy and Bailey split a serving of Brown Rice Pudding and a Fresh Fruit Salad. The fruit salad was a good, if pretty typical mix of berries and melon with a little bit of pineapple thrown in. The strawberries were especially succulent, which had Brandy and Bailey performing a dance of the forks as they raced each other for every little red morsel. The rice pudding had a very unique texture, not at all mushy, but an almost al dente chew, and had been flavored with a soft compote of agave syrup and bananas. "I'll trade you the last spoonful for the last strawberry," Bailey said only half jokingly. Their gracious server quickly swept in to clean up the table as Bailey and Brandy made a beeline for the cafe and pantry section, where they each grabbed one of the containers of Speculoos before anyone else could. Not able to control herself, Brandy also ordered up a few of the luscious looking pastries from the case (a French Cream Donut, an Apple Cannele, and a Pistachio Tart) to take home and gorge on later. Thoroughly impressed by Le Pain's commitment to fresh, local, and organic food, Brandy declared, "This is no chain restaurant, as far as I'm concerned. This is simply a wonderful bakery with a lot of siblings." The writers of this blog were invited to dine at Le Pain Quotidein at no cost in exchange for an honest review. Food News: Exclusive Interview with MasterChef Contestant Elise Mayfield! Do not ask Brandy about Gordon Ramsey. Ever. "I taught him everything he knows, that little ingrate," she will mumble before launching into a tirade of curse words not heard since Shakespeare invented them. Whether this sentiment is true or not (or what the story is behind her rage) she will not say, but one thing is for sure: Brandy has never missed an episode of MasterChef. "Look at him, judging those poor young hopefuls," she will say, "When I knew him, he didn't know his risotto from his orzo and now look at him! And that Graham Elliot, what a sweet boy. I'd cook for him any day of the week. Looking so proper in his little bow tie. That's how you dress for a meal"
As you might imagine, when MasterChef premiered its current season on Fox this past Monday, Brandy was more than ready for it. But this year, she decided to do her civic duty and really get to know one of Chicago's representatives on the show; a plucky young lady by the name of Elise Mayfield. Originally from Alabama, Elise moved to Chicago 7 years ago with dreams of pursuing a career in comedy, but her new found independence brought her a an unexpected hobby: cooking, and she turned out to be pretty darn good at it. For those of you who watched the premiere, you'll know just how determined Elise was to get her apron from the judges, and she's quickly become a fan favorite for her down home recipes, her dogged perseverance, and her quirky personality. What first peeked your interest in cooking? I always loved watching my grandmother, Mawmaw, cook for our big family dinners as a kid. But I didn't really start cooking until after I moved to Chicago after college. The longer I was away from home, the more I missed those Alabama comfort foods. So, I started off with boxed cake mix and made my way to homemade baked goods, and eventually I branched out to cooking big meals for dinner parties and catering gigs. What made you want to try out for the show? Honestly, I auditioned on a total whim. I'd seen some of the episodes from Season 4 and really enjoyed them, but it wasn't something I'd ever thought about doing. But, a friend of mine who is a big fan of the show saw the casting notice for the open call and told me that I should go. The audition was the next day, less than 24 hours away. But, I figured "Why not?" So, I threw caution to the wind, baked up some handpies, and went to the audition. I had no idea the journey that one decision would take me on, but I'm so glad that I went. Oh, man. Tough call because Gordon and Joe are so different! But, I have to say that Joe is still a little scary to me. He looks at cooking from a restaurant position and he's a real straight-talker. There's no sugar coating with Joe. It's either good or it's not. Gordon is a little more like a coach. He believes in you and wants you to always strive for your very best. And, yes, Graham is just as wonderful as he seems on the show! How has doing MasterChef improved your cooking skills? What were you looking forward to learning? My time on MasterChef definitely made me a better cook. Not only did I learn new techniques, but I learned not to be afraid to try new things. I also learned so much about plating and presentation. Food that looks good on the plate will taste even better! Not only did I learn from the chefs, but I learned so much from my fellow competitors. It was amazing to be able to "nerd-out" about food with peers who were so knowledgeable. As a relatively new cook, I still have lots to learn, like butchering and barbecuing, but I look forward to making progress in the kitchen. Was there anything you were really hoping to cook on the show, such as something you are particularly good at? Was there anything you were particularly terrified to cook going in? I was really hoping for some dessert challenges, since baking is my comfort zone. I knew I could rock out some cakes or cookies. And, I was nervous about cooking with proteins I'd never dealt with before, like rabbit or quail. Those proteins are so delicate and can dry out so easily, if even slightly over-cooked. Say we gave you a mystery box with artichokes, goat cheese, canned cranberry sauce, graham crackers, quail eggs, and squid ink fettuccine. What would you make for us? Oooooo, mystery box. Hmmmm. Ok, can I have some staple ingredients like shallots, butter, and wine? If so, then I think I would have to go with squid ink pasta in a cranberry and white wine reduction sauce with roasted artichoke hearts and poached quail eggs, garnished with fried graham cracker coated goat cheese balls. As we are Chicago's Brunch experts, tell us about your favorite things to eat for brunch?! Oh, man. How much do I love brunch? So much. I like sweet and savory dishes, so I love dishes like stuffed french toast with bacon, but, I can almost always be won over with breakfast tacos. 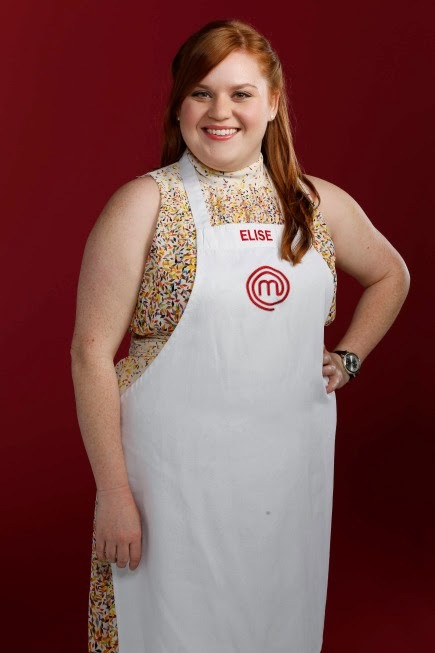 You can watch Elise battle for the title of MasterChef every Monday at 7:00 CST on Fox! And if you missed the premiere episode, make sure to check Fox's MasterChef website Also make sure to check out Elise's blog for awesome recipes! "I'm looking for new ideas," Brandy's old friend Mama Bee told her one day, "My honey empire is going steady, but I'd like to branch into some of these niche markets I've heard so much about." "I don't understand," Brandy said, "You do well with honey. Why not just keep doing that?" "No one wants just plain old honey any more. They want Orange Blossom Honey or Clover Field Honey or Bacon Honey. They want everything familiar and every day twisted into something new and exciting!" "Yes, but those are just fads. When everyone stops obsessing over the latest food trends, what will they want? Just plain old honey. Sometimes the original way of doing things is the best way, if you ask me." "I don't know. Why don't I take you out for brunch so we can discuss this a little further." Of course, Brandy didn't need to be asked twice. Brandy chose the newest darling of the young and fashionable foodies of Wicker Park, Trenchermen. Starting out as a pop-up restaurant in 2012, headed by a pair of highly seasoned culinary brothers, Trenchermen has found a permanent home in a space that has seen a lot of history (originally it served as a bathhouse to the Eastern European immigrants in the area, and then underwent several transformations before almost being demolished). Their stated mission is to make familiar food to old fashioned standards using new and exciting techniques, so its no wonder Brandy thought this spot might be the perfect place to make her point to Mama Bee. The entrance to to Trenchermen was one of the most impressive that Brandy had ever seen with the patron's first view being of the bar area, which opened grandly a few steps down from the host station. "Reminds of the tea rooms of old," Brandy said wistfully to Mama Bee, "A little more rustic, perhaps, but just as grand." The two were escorted to the dining area just beyond the long bar which was rather small by comparison, but not without it's charm. One wall of the dining room was taken up by an ingenious wine rack that carried through the theme vintage steel work. Overhead, the lighting fixtures were exposed with long pieces of rope strew across them, as though ready to hoist pieces of a theatrical set into the air, and the heavy wooden tables and chairs looked almost more like butcher blocks. The overall vibe was one of deliberate and detail shabbiness, not overwhelming, but definitely unique. Brandy could see the hipster crowd native to Wicker Park approving of the vintage-ness of it all. Though there were plenty of breakfast cocktails on offer (including shots that weirdly beloved Chicago liquor, Malort), Brandy and Mama Bee were more intrigued by the specially curated tea and coffee. Brandy went with a nice, soothing Rare Tea Cellar Chamomile, while Mama Bee sampled the current coffee (Trenchermen works with a different specialty roaster each month). Starting off the meal, Brandy chose the Wild Blueberry and Burrata Danish, a lovely fresh twist on a rather traditional breakfast pastry. The Danish itself was pretty typical, but done well, with a tender, flaky texture and a warm, buttery taste. The creamy burrata cheese (similar to a fresh mozzarella) certainly made for a unique choice over a more traditional cream cheese or mascarpone, but matched well with the fresh and tart blueberry compote. A small sprinkle of dried herb on the top added a nice sophistication to the pastry without adding too much of a savory slant. "I do appreciate a hearty helping of the cheese and blueberry," Brandy said as she tried to lift the pastry off the plate, "But it does feel a little odd to be eating a Danish with a knife and fork. The filing is simply too much for the delicate pastry underneath to support!" Mama Bee went with the Greek Yoghurt, which came layered with fresh strawberry compote and a side of crunchy quinoa granola. Again, this seemed to be a very recognizable dish, but with a few added twists to freshen it up. The house made yoghurt was amazingly thick and creamy with a good tang to it, matching well with the sweetness of the fruit. The granola, which was dotted with bright red quinoa, had been slightly salted, adding even more complexity to each mouthful. "You know how I feel about salty and sweet combining," Mama Bee said with a raised eyebrow, "But this is actually a pretty nice combination. I think I even detect some honey in the compote. Do you think I should talk to them about buying some of mine?" Brandy shook her head, exasperated. For her entree, Mama Bee decided to continue with the salty and sweet theme and ordered the French Toast and Sausage Strata. Her plate was beautifully presented, with the bite sized bits of French toast and house made chicken sausage served in checker boarded slices and adorned with a paint of blood orange marmalade and a perfectly over easy egg. The French toast was very soft and custard like, almost more like a bread pudding, while the sausage packed an uneven punch of heat. "Some pieces are just fine, but others... wow! It's quite a spicey wake up call for my tongue!" Mama Bee exclaimed, "But a little dip in some maple syrup seems to tone it down." The portion size seemed a bit small to Brandy, especially considering the price of the dish ($12). Brandy went with the signature Breakfast Sandwich, which featured the star of the brunch menu, something simply labeled as "Bacon Stuffed Bacon." "I can't even imagine how that would work," Brandy mused when she first saw the item listed. The sandwich came a little more rustically presented than Mama Bee's dish with a hearty side of breakfast potatoes. Though the texture of the potatoes was spot on (a lightly crispy exterior with a velvety smooth interior), there didn't seem to be any flavoring other than an over abundance of salt (in fact, just three bites of the potatoes forced Brandy to finish off an entire glass of water). The sandwich was served on a very soft, but very stable roll, and came topped with a perfect sunny side up egg and some melty white cheddar. Once the top went on, the egg burst, coating everything with a sort of self made sauce. The mysterious "bacon stuffed bacon" seemed to Brandy to be nothing more than a thick, smokey slice of cured ham. "It doesn't actually taste much like traditional American bacon at all," Brandy grumbled, "In fact, smokey ham is the only thing I can taste on this sandwich. The cheese might as well not even be there." As has happened before with such sandwiches, Brandy couldn't help but wish for a little slice of tomato or a few green leaves to help break up the overt richness of the egg and meat. "I suppose this is what you might call a 'manly' dish," Brandy said, setting the thing down after a bite or two, "And maybe I'm just not man enough for it." Though the atmosphere was comforting and the service utterly stellar, Brandy couldn't help but feel a little let down by the food at Trenchermen. With the bill coming to just over $60 after tax and tip for just 2 appetizers, 2 entrees, and a couple of servings of tea and coffee (and no cocktails), the so called "food for the everyman," seemed more like, "food for the everyman on payday." Although Brandy appreciated that the majority of the ingredients were house made and obviously high quality, in the end, the overall taste was only slightly above average. "They say they want to be an old fashioned neighborhood joint," Brandy said as she and Mama Bee left, "But what they really seem to be doing is exactly what their hipster clientele do; putting a beautifully thought out facade over what is essentially the same old thing." "Yeah, maybe you're right after all," Mama Bee sighed, "Bacon Honey might sound good today, but plain old honey will still be my best seller tomorrow." Hoosier Mama Pie Company and more at Macy's American Icon Event! It has been said that an objective observer is always more qualified to become an expert in any particular subject, and if that holds true, then Brandy, as an observant outsider, can certainly be called an expert on American culture. Though she has traveled the world extensively and lived in the USA for quite some time, Brandy's quintessential Britishness still seems to hold true in most cases, but there are a few cracks that have begun to appear over the years, such as a liking for grilled sausages on buns in the summer time, an actual understanding of the differences between American and National League baseball, and a certain fondness for the music of Big and Rich (which Brandy will deny wholeheartedly, if confronted directly). One American institution Brandy will admit to adoring is Macy's, especially that venerable old and impossibly beautiful store on State Street that once upon a time was the storied home of Chicago's iconic Marshall Fields. Recently, Brandy learned that Macy's was launching into summer with their American Icons campaign, celebrating everything that is quintessentially American, from music to cuisine to fashion. Kicking of the campaign was a series of amazing events that included performances from jazz singer Erin McDouglad, Chicago Dance Company, and Motwon: The Musical, a cooking demo from Hoosier Mama Pie Company, a men's fashion show hosted by Details Magazine, and a summer entertaining party featuring exotic cotton candy from Spin-Spun and fun mocktails from Tim Williams of Pour Souls. Music, candy, cocktails, and pie was something Brandy just couldn't say no to. Starting at 12:00 on the dot, performers from Motown: the Musical (currently playing at the Oriental Theatre downtown) took the stage on the lower level to invoke the spirit of the 1960's Detroit with dead on imitations of The Supremes, the Temptations, and other oldies favorites. The crowd quickly got into the performance, especially when one of the male singers grabbed an elderly lady to dance with, who surprised everyone (including the performers) by dropping to the floor in a split! "I could do that, if I wanted to," Brandy informed the people standing near her, "You might hear a lot of metallic creaking from my titanium hips, but I could do it." Then, as the Erin McDouglad Jazz Quartet took the stage to serenade shoppers with classic jazz standards, Brandy grabbed a seat for the cooking demo from Paula Haney of Hoosier Mama Pie Shop. The demo started off with a wonderfully detailed description of how Paula makes the pie crust dough for all of her confections. "I've done a lot of experimenting over the years and I've got it down to a science," she said, admitting that even though her recipe had only 5 simple ingredients, an entire chapter of the the Hoosier Mama Book of Pie was dedicated to the making of the all important crust. Going through the specifics, like the type of salt she uses, the amount of sugar, and how she treats her butter to get the perfect flaky texture, showed just how much work Paula has put into the recipe and just how proud she is (and should rightly be) of that work. Next Chef Paula showed how to make a very simple rhubarb filing, which had both a sweet and tart flavor and was perfect for summer. Just watching her crimp the pie crust by hand was enough to hypnotize the audience and kept most of the crowd in their seats, even after the Chicago Dance Company took the stage behind the demo to put on a show of modern, contemporary, and jazz dance. "It's nice that they gave us backup dancers," Chef Paula joked with her comrade Allison Scott, who takes charge of all the savory recipes for Hoosier Mama. Next, Chef Allison took the lead by demonstrating how to make a fresh and simple asparagus and ricotta quiche, even making her own ricotta live in front of the crowd. Samples of the quiche were passed around so that everyone could experience its silky texture for themselves. "The best part is, you can adjust this recipe for any season," Chef Allison said, "Asparagus is in season right now, but you can use any vegetables you'd like. At the shop right now we're doing a bacon and cheddar quiche, a mushroom gruyere quiche, and a pea and ramp quiche." After the demo ended, Brandy had a few more hours to pass before the second round of events began. Unfortunately, she mistook the bedding department for "One of those trendy nap boutiques I've heard all about," and fell asleep on a Martha Stewart Home display until just before the store closed. The good news is that Macy's is hosting another round of events this Saturday including face painting for kids and a fashion show from INC. "And if there's anything more American than shopping till you drop," Brandy said, "Than I'd like to know what it is." You can see tons of pictures from yesterday's events on Bunny and Brandy's Facebook page! The writers of this blog have been compensated by Everywhere Society for the information contained in this post, but the opinions of the writers have not been dictated or influenced. Postcards from Bunny: Red Gold Aioli Party! Our dear Bunny has been one busy lady indeed these last few months. Her travels with her archaeologist husband, Benedict, have taken her to every hidden corner on earth in search historic treasures, myths and legends, and the occasional mummy. Recently, she was to be found exploring the ancient caves in the Provincial region of France and came across some very usual drawings. "I saw faintly painted figures mixing what looked to be egg yolks, oil, and lemon juice in a mortar," she wrote to Brandy, "And I realized that I had just stumbled on an ancient recipe for aioli! And ever since then, I haven't been able to get the craving for that delicious spread out of my mind. I simply must start doing some experiments the next time I have access to a working kitchen." Luckily for Bunny, Red Gold Tomatoes have recently come out with ten delicious recipes for tomato aiolis in celebration of springtime. Overwhelmed by the choices, Bunny decided to whip up a few of them and try them out with different dishes to once and for all satisfy her craving for that creamy goodness. Make sure to check out Bunny's recipes below, as well as Red Gold's Facebook, Twitter, and Pintrest for all the aioli recipes and find out how to enter to win a $250 aioli prize pack! *The writers of this blog were sent promotional products by Red Gold Tomatoes for the purposes of writing this post. Combine mayonnaise and tomatoes in a small bowl. Refrigerate for at least an hour so that the aioli has a chance to set. In a shallow dish, combine the eggs, mustard, vinegar, and red pepper, scrambling with a fork. Place panko bread crumbs in a second shallow dish. One strip at a time, dip the bacon first into the eggs mixture, then the panko crumbs, making sure both sides of the bacon are thoroughly coated. Place breaded strips on a sheet pan and bake at 400 degrees for approx 15 minutes, or until golden brown on both sides, flipping the bacon halfway through cooking. Set bacon on a paper towel to absorb excess grease and allow to cool. On a thick slice of sourdough bread, spread a generous layer of the tomato aioli, then top with your favorite greens (Bunny suggests a peppery arugula to counter act the saltiness of the bacon), 3 strips of the breaded bacon, add a little more aioli just to hold the sandwich together, and place the final piece of bread on top. In a small bowl, combine the tomatoes, pesto, and mayonnaise. Refrigerate for at least an hour to allow the aioli to set and the flavors to combine. In a medium sauce pan, bring salted water to a soft boil. Carefully crack the eggs into a ladle, then deposit them into the boiling water. Using a slotted spoon, skim off any egg whites that may float to the top. After about 3 minutes, check the firmness of the eggs: they should be opaque and soft, but able to hold their shape when removed from the water. Set eggs on a paper towel to dry. Place English muffin halves on a plate and add about a tablespoon of aioli to each half, then add some of the greens, then the eggs, and finally top with just a little bit of aioli. Serve immediately. Cut the top 1/4 off of the head of garlic, making sure all of the cloves are exposed, and peel off all of the papery external layers,. Rub1 tablespoon of olive oil into the head of garlic, then sprinkle with salt. Place in an oven and bake at 400 degrees and cook for about 30 minutes, or until you can smell the garlic and it appears golden brown on the top. Test to see if it is done by squeezing on of the cloves. It should be soft and give with no resistance. After the garlic has cooled, remove the cloves with a fork and mash them to an even consistency. Combine the tomatoes, mayonnaise, and roasted garlic in a small bowl and refrigerate at least an hour to allow the aioli to set and the flavors to mingle. In a large sauce pan, heat the remaining tablespoon of olive oil over medium high heat and add the mushrooms. Once the mushrooms have begun to release their liquid (approx 4-5 minutes) add the sausage. Turn heat down to medium, add salt, and continue cooking for 10 minutes. Add the sherry and thyme, reduce for 5 minutes. Add the milk and cook for another 5 minutes, or until the mixture begins to thicken up. Cover the slice of bread with a thick layer of the roasted garlic aioli, then ladle the sausage and mushroom gravy over the top. Sprinkle with additional thyme for color, if desired. Tea Time with Brandy: Hamilton Beach Giveaway! *The writers of this blog have been provided with sample products at no cost by Hamilton Beach for the purposes of writing this review and hosting a giveaway. First it was cupcakes. Then is was bacon. Now, it seems the trendiest of foodies are scabbling after donuts. But not just any donuts; after Dominique Ansel's Cronut appeared last year, it set off a wave of donut hybrids, culminating recently in Chicago's own Waffles Cafe creating what they call the Wonut (a waffle/donut hybrid, if you couldn't tell). Never one to follow trends for the sake of it, Brandy has been left confused by this latest fashion. "What was wrong with the donut in the first place that we need to be breeding it with other pastries?" she asked when first being told of the trend, "I've always found donuts to be pretty damn tasty on their own without any more interference than a few choice flavorings." To prove this point, she set about creating some donuts of her own, using a simple yeast donut base and sugar glaze. Her flavoring choices, influenced by the burgeoning spring produce counter in her local grocer, were red pear, green pistachio, and a good quality vanilla (Brandy prefers Nielsen Massey products). To make both the donuts and the glaze, she utilized two of her brand new Hamilton Beach appliances, The 6 Speed Soft Scrape Hand Mixer, and the 6 Speed Stand Mixer, which helped her fore into fried dough go that much smoother. The stand mixer (which comes with whisk, paddle, and dough hook attachments) was an absolute dream to use. No more would Brandy's biceps become inflamed with whisking and mixing, because this mixer could do everything. She especially loved the circular mixing action, which helped to incorporate ingredients completely with minimal scraping down of the sides of the bowl, a real help in a yeast based recipe, which creates a rather sticky dough. Also helpful were the suction cups on the bottom of the appliance, that helped it stay in one place while replacing attachments, unlocking the bowl, and even when on the highest speed. Though a little bulky looking, the mixer was actually very light weight, making it easy to move from counter to storage when everything was done. The hand mixer came with two sets of whisk attachments, one which had been coated in rubber so that the whisks themselves also became like a spatula, scraping down the sides of the bowl while Brandy mixed the sugar glaze for the top of the donuts. The included plastic case also provided a convenient place to store all of the attachments, the chord, and even the mixer itself (its just snaps on to the top of the case). Pour the milk into a microwave safe dish and heat for about a minute until milk is hot, but not boiling. Place the shortening in a bowl and pour warmed milk over it. Set aside. In a small bowl, combine the yeast and the warm water and let dissolve for 5 minutes. After 5 minutes, pour the yeast mixture into the large bowl of a stand mixer and add the cooled milk/shortening mixture. Add the eggs, sugar, vanilla, salt, shredded pear, and half of the flour. Using the paddle attachment, combine the ingredients on low speed until the flour is incorporated and then turn the speed up to medium and beat until well combined. Add the remaining flour, combining on low speed at first, and then increase the speed to medium and beat well. Change to the dough hook attachment of the mixer and beat on medium speed until the dough becomes smooth and uniform. Transfer to a well-oiled bowl, cover, and let rise for 1 hour or until doubled in size. Punch down dough, then cover and let rise for another 30 minutes. Heat the oil in a deep frier or large stock pot. Using a large spring action ice cream scoop, gently drop balls of dough into the oil, 3 to 4 at a time. Cook for 1 minute per side, or until golden brown. Transfer to a cooling rack placed in a baking pan and lined with paper towels to absorb any excess oil. Allow to cool for 15 to 20 minutes. Fill a large syringe or pastry bag with the custard and inject a small amount straight into the middle of the doughnut, slowly pulling the syringe back as you lessen pressure on the plunger. Glaze the doughnuts and let set for another 30 minutes or until the glaze has hardened. Combine all ingredients in a medium sized bowl and mix with a hand mixer on medium/ low speed until the icing has a uniform consistency, about 2-3 minutes. Dip the top of the doughnuts into the icing, then place on a rack to let excess icing drip off. Let the glaze harden approx 30 minutes. And now for the moment you've all been waiting for, the GIVEAWAY! Below this paragraph, you will find our handy dandy Rafflecopter widget, which will list all of the ways you can enter. This contest is open to all USA readers over the age of 18 and will run for one week with the winners being announced next Friday, May 9th before 12:00pm CST. There are three prizes to be won: 1st place gets a brand new Hamilton Beach 6 Speed Stand Mixer (retail value $129.99), 2nd place will get a brand new Hamilton Beach Hand Mixer (retail value $34.99) and 3rd place will get 5 certificates for free Fresh Cut Fries at any participating Penn Station Subs location! Good luck!